Quote Reply Topic: Get the Kids out on the water. ^Great pic. That'll make you forget all about the maintenance, upkeep, high gas prices, the scratch in the gel coat, etc. That crap that I have a feeling a lot of us here are guilty of letting get to us. That picture is what it's all about. I asked valentino a couple of times if he wanted to go with me on the tube and he didn´t ..so I didn´t push him...eventually he will ask me and I´ll be more than happy to take him!!!! not even certain I could get in and out of a tube. neighbor. I may have to buy one. That's really cool Brian. Great pic! Has she had swimming lessons yet? She looks so comfortable out there behind the boat. Yes Mike,started swimming lessons when she was 6 or 7 months old. Since March we've had her in private lessons, or lessons with just one other child, twice a week. Those will continue at least into November for this year. She can't swim yet, but she's getting there. My wife has full discretion over the activities, with the exception of swimming. It is the one thing I insist upon. I don't care if she ever chooses to compete, but I expect her to be very competent in the water. 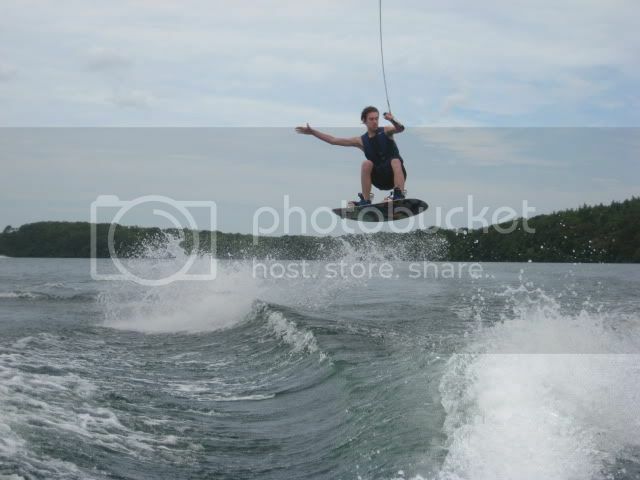 Here is a pic of my older son from last summer. He is 5 in this picture. He doesn't have the itch for skiing yet this summer. 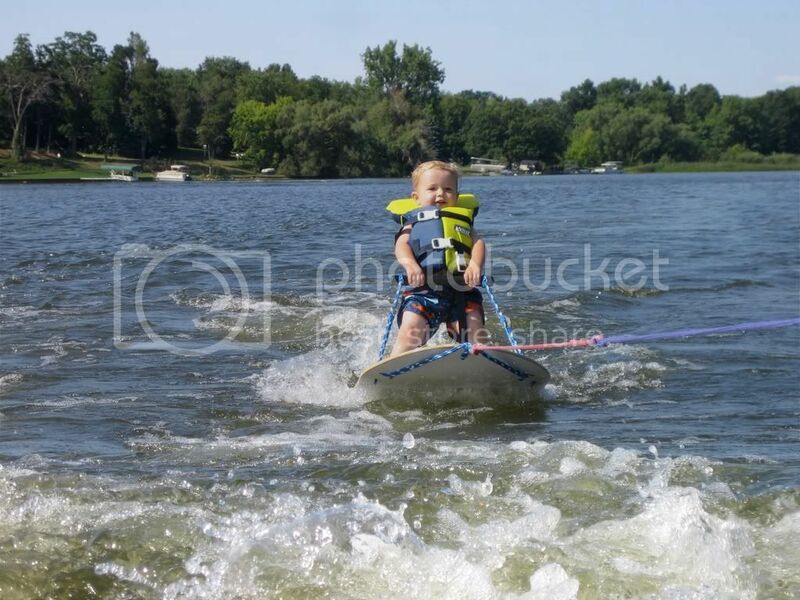 He just wants to ride the kneeboard, but that's better than the tube. Excellent Scott. Looks like he's doing great out there. I hear you BKH. Our kids have been swimming since they were 3. Now 10 and 11, they are extremely confident in the water.While we still keep a close eye on them,we don't have to be right on top of them if they want to jump off the dock,etc. They spend alot of time with their cousins at the lake and a few of them are scared to death to even get on a tube out away from shore(but we're working on them). 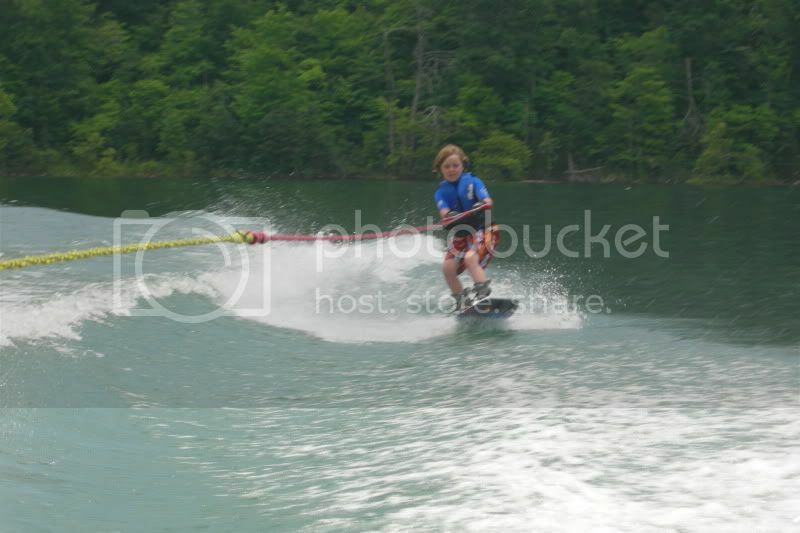 A couple pics of my twin boys at Norris Lake last week. We had a great time. Great pics. When you start them out young like that, they still want to hang with you when they're teenagers and even older. My kids are 21, 18 & 15, and they've always been disappointed when they can't make skiing in the morning or a cruise in the afternoon due to work. They've been able to take the boat by themselves since they were about 14 and they'd rather take their parents along rather then leave them on the beach. 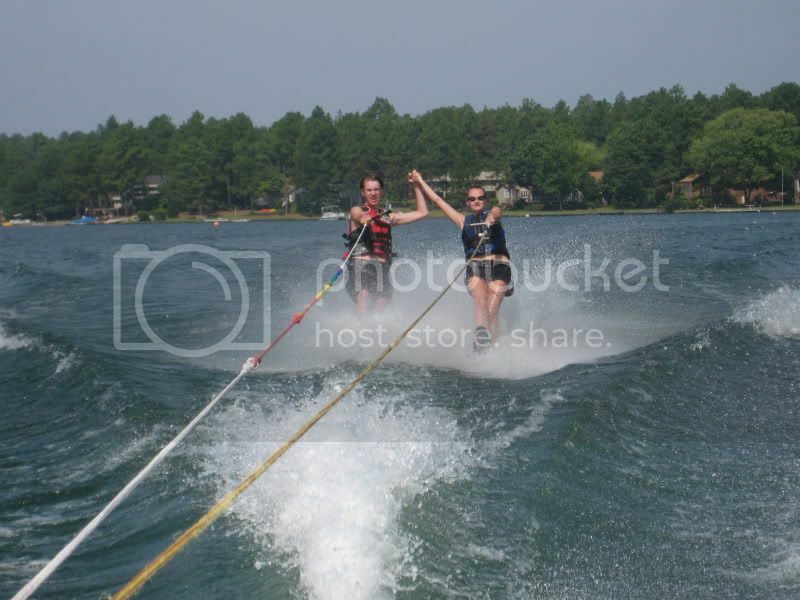 Boating, skiing, boarding are great family stuff. My wife had all our kids in swimming lessons at the YW when they were tots. Definately a good way to go. Here's a picture of a member of our ski team's son at 16 month's. 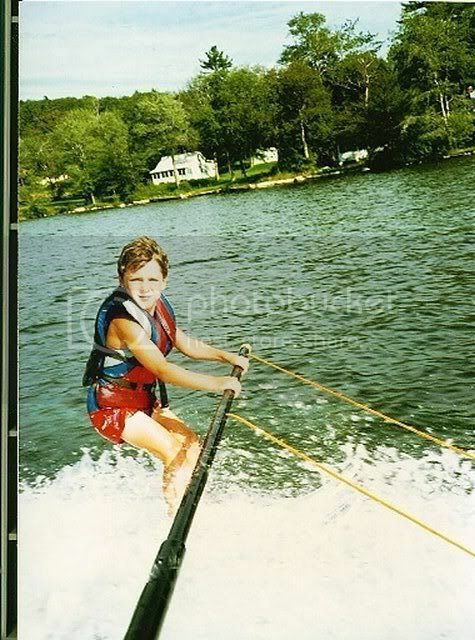 He's riding a ski skimmer, which is one of the best tools to get kids comfortable behind the inboards. Unfortunately I have no pic to post or to savor over the years, but our daughter Tessa got up on two for the first time yesterday. She's 6 this summer and my wife thought maybe we were pushing it a bit, but she always thinks that! I picked up the HO trainer ski package (skis, bar and special tow rope.) After looking it over I ditched the training rope set up and elected to let her have a go w/ the traditional tow rope. I got in the water with her to help and coach and on the 4th pull she was up and I was left two hundred yards behind cheering in her wake. Very bittersweet since I couldn't see the look on her face when she was up, but the smile on her face when I caught up to her was ear to ear! Randy: Been off for awhile so I missed this post...where did you go at Norris? We are headed down there after we visit GL. Water looks real high. Man I can't wait to get there. Great pics guys...I enjoyed them all! OK, I realize my kids are a little old for me to be playing this game, but just because they are older, doesn't mean we still don't have fun out on the water together or that I can't be a doting parent. Just took this one yesterday. Dude, awesome shots of your girls! Larry, Thomas can get some air! Is that behind your Ski Tique? Yes Bruce, that's the tique. He was in pretty good form yesterday...may have something to do with the pretty redhead he brought along for the first time....you remember 16, don't you? I do! it usually ended in some sort of pain that needed massaged out. 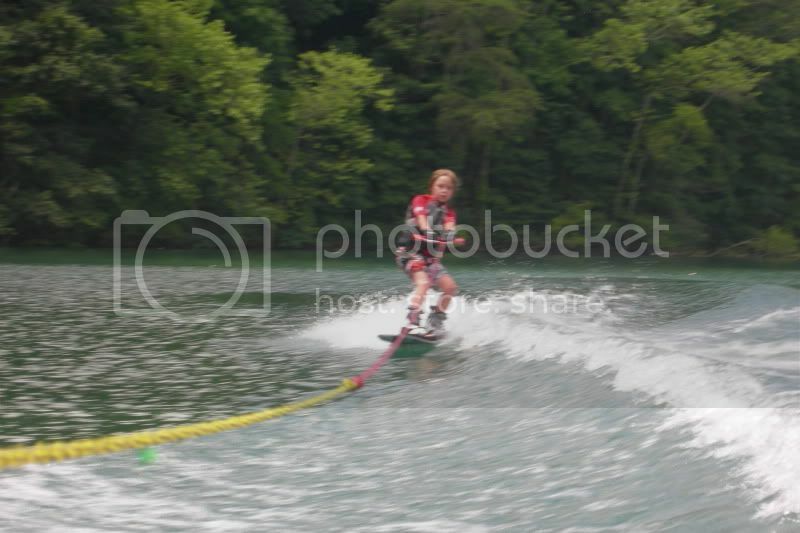 The spills were a lot more painful when I was barefooting and slalom skiing. I came ripping in to the dock for a big soaking of the girls on the dock, planted the ski and then found out i was going a little fast on the whip... I did not have enough weight to keep it planted and ended up tangled in the boat lift. Oh to be indestructible again. Take your work seriously, not yourself. This is my sons first time up for an extended period of time. I got my youngest (3) to give us a thumbs up between crying getting on the kneeboard with me.